Daredevil T-Shirt by Osmar Escoto. 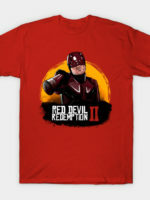 Show everyone that you are a fan of Daredevil with this t-shirt. It's a parody of the Amazing Spider-Man comic book.